Trilliums (Trillium spp.) 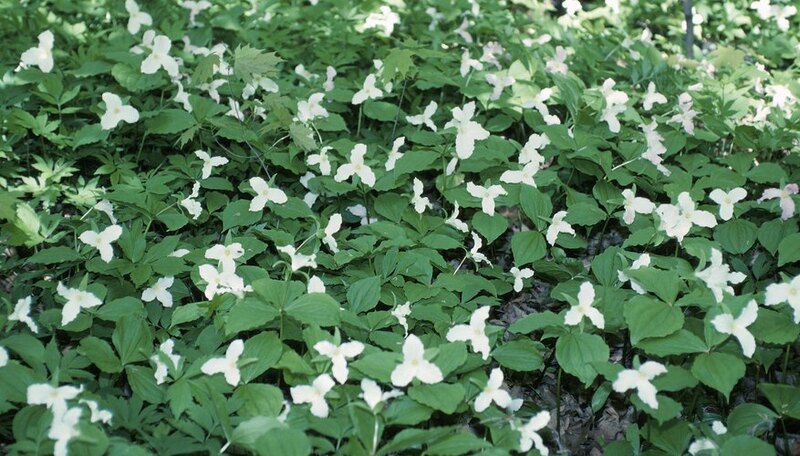 are graceful woodland plants desirable for their distinctive, three-petaled flowers and ease of care. The plants thrive in cool, moist conditions and grow best in U.S. Department of Agriculture plant hardiness zones 4 through 9, depending on the species. Trilliums are classified as poisonous plants, according to North Carolina State University Cooperative Extension. Trilliam berries and roots are only mildly toxic if eaten, according to North Carolina State University Cooperative Extension. They contain steroidal saponins, which can cause severe vomiting and diarrhea if consumed in large amounts. Interestingly, Native Americans used the roots of one species, the snow trillium (Trillium nivale) as medicine. Ironically, the leaves of the plant are edible. They are best harvested when the leaves unfold, then washed thoroughly and cooked for ten minutes in salted, boiling water. Think twice before you sample these greens, however, as plucking new leaves from the plant may kill it. Trilliums are part of the lily family, and they grow on rhizomes. Just like lilies and other bulb plants, they store nutrients in their rhizomes. Each summer, the plants wilt in the heat. As the foliage dies, the nutrients are returned to the rhizome so the flowers can bloom again next spring. If you pull the leaves from the plant, the nutrients will not return to the rhizome, and the plant may never bloom again. Trillium plants are poisonous to cats and dogs and will cause them the same digestive issues as suffered by humans, according to the Deerfield Veterinary Clinic. If you do choose to cultivate this plant, keep it out of reach of your pets. One animal that is likely to graze on the plant is deer, who seem to suffer no harm from nibbling on the plant. Trillium are categorized as a plant frequently damaged by deer by the West Virginia University Extension Service. If you are looking for a plant that is deer-resistant, trillium is not a good choice. Treatment is usually management of the symptoms. If you suspect a young child has consumed the berries or roots of the plant, contact your local poison control center immediately, as well as your family doctor. Antidiarrheals will likely be given. If one of you pets consumes part of the plant, contact your veterninarian immediately, who may also issue your pet an antidiarrheal and treat your pet for dehydration if necessary. North Carolina State University Cooperative Extension: Trillium Spp. The University of Texas at Austin Native Plant Database: Trillium grandiflorum (Michx.) Salisb.